Scopri il meglio dell'Isola del Sud in un tour terrestre, marittimo e panoramico da Queenstown a Milford Sound. Viaggia attraverso il Parco Nazionale di Fiordland, patrimonio dell'UNESCO, incluso Mitre Peak, in autobus. Quindi sali su una crociera attraverso Milford Sound e goditi un delizioso pranzo a buffet. Un volo panoramico sulle Alpi Meridionali torna a Queenstown completa questo tour di un'intera giornata con una vista dall'alto che ti toglierà il fiato. Inizia la tua partenza per Queenstown a Milford Sound con il pick-up in hotel con pullman di lusso, abbracciando le rive del lago Wakatipu color zaffiro con la robusta gamma Remarkables come sfondo. La guida si ferma per il tè del mattino (a proprie spese) a Te Anau, considerata la porta del Parco nazionale di Fiordland, patrimonio dell'UNESCO. Preparati ad essere stupito dalla grandezza del paesaggio durante tutto il viaggio in pullman panoramico. Passeggiando per la valle di Eglington, attraverserai boschi di faggi alpini e fermerai per le foto al Mirror Lakes. Prosegui fino alla Hollyford Valley, oltre Christie Falls, e attraverso l'Homer Tunnel prima di imboccare la valle di Cleddau sulla tratta finale verso Milford Sound. Salta su un lussuoso catamarano per una crociera turistica. Lungo il percorso, sei circondato da una fitta foresta pluviale e cascate che cadono dalle pareti rocciose scolpite dal ghiacciaio nelle acque incontaminate del suono. Un equipaggio informativo fornisce commenti su guglie come Mitre Peak, e ti aiuta a individuare i mammiferi marini e la fauna avicola tra cui foche di pelliccia della Nuova Zelanda, delfini tursiopi e pinguini di Fiordland. 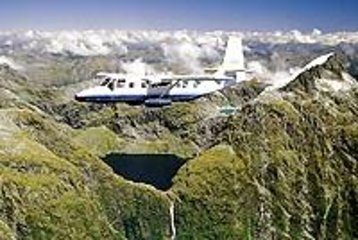 Goditi un delizioso pranzo a buffet a bordo prima di scambiare la tua barca da crociera per un volo panoramico di Milford Sound con un aereo leggero. Il volo di sola andata da Milford Sound a Queenstown svetta su Fiordland e in altre regioni della campagna selvaggia della Nuova Zelanda, comprese le Alpi Meridionali innevate (tempo permettendo). All'atterraggio a Queenstown, il tuo tour di un'intera giornata termina con un trasferimento via terra al tuo hotel. The weather on our May trip was terrible. This area is best to visit in NZ's summer and spring. We saw many rainbows due to the rain, but rain prevented the beautiful views of mountains. Driver was amazing on the treacherous roads and was very knowledgeable about the area and told historical tales. Boat trip was ok, but the rain was a factor. Bring your own lunch as food on the boat was not the best. We did not get our flight due to weather. Viator is refunding our fee for the airplane. Great tour. Disappointed that couldn't book helicopter return, only fixed wing, however on the day fixed wing weren't flying and was able to convert to helicopter return. Well worth it! Experiencia redonda. Viaje de ida agradable, con paradas en sitios destacables y llegada a Milford a la hora perfecta para comer. Crucero impresionante y retorno a Queenstown en un vuelo espectacular. Inolvidable. An early start and long coach journey from Queenstown to Milford Sound. However, it was worth the trip for the spectacular scenery and cruise. We were even lucky enough to have dolphins follow the boat for some of the way. The bento box lunch was excellent good quality and plentiful and it avoided having to queue for the buffet food as it was at our table when we arrived on board. The only disappointment was the cancellation of the 40 minute flight back due to poor visibility no rain or snow but simply low cloud. The 4 hour return coach trip was comfortable but nothing exciting. We were offered a helicopter trip back but this was a lot more expensive. The refund for the flight portion of the trip was received quickly and without hassle. Fantastic trip through a very beautiful area of the South Island of New Zealand. Bus driver was on time picking up from hotel and very knowledgeable in telling us what we were seeing on our 4 hours ride. We were lucky to have a perfect weather day! Lunch on the boat in Milford Sound was a bit of a disappointment in terms of food quality. Scenic flight and pilot were tremendous pilot was great about pointing out different things we were seeing. All in all a wonderful experience and I would definitely recommend. The coach journey and the boat trip were both fine and the beautiful weather made the day in the Fjord. What completely spoiled the day was that after getting off the boat, and thus with only fifteen minutes notice, our scenic flight back to Queenstown, which we had really been looking forward to, was cancelled. Considering that the weather was perfect, and that other plane companies were flying back to Queenstown, this was disappointing and unacceptably poor. It ruined our day. Scene flight was AWESOME, highly recommended. The cruise itself was wonderful with lots of beautiful scenery. Beautiful sights! It took forever to get there but was well worth the trip. Most beautiful place in New Zealand was Milford Sound. The plane or helicopter ride back is so worth it! You get great aerial views of the majestic beauty that is NZ! Also, you get home so much faster than that long bus ride. I would recommend! a fantastic day trip with a very knowledgeable coach driver. scenery was absolutely fantastic, lunch on milford sound very good. cruise very good too. we were fourtunate to have great weather and were able to get our planned fixed wing transfer back to Queenstown. only took half an hour to get back. highly advisable and wot a view from the air. certailnly would recomend this tour to any one.